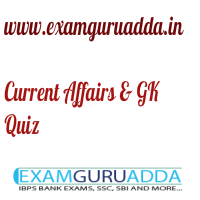 Dear Readers Examguruadda.in presents Current Affairs Quiz Questions and Answers of 5-6 March 2017 that cover important current affair events. Current Affairs quiz for IBPS PO,clerk, RRB-Po,Clerk, SBI, NIACL,Railways and SSC Exams. 1. The 13th edition of Economic Co-operation Organisation (ECO) summit was held in which country? 2. The National Conference on Innovation in Educational Administration has started in which city? 3. Which company has become the new team sponsor for the Indian Cricket? 4. Who is the author of the book “Lincoln in the Bardo”? 5. Thomas Earl Starzl, who performed the world’s first human liver transplant, has recently passed away. He hailed from which country? 6. Which city has topped the 2016 Annual Survey of India’s City-Systems (ASICS) Urban Governance ranking? 7. Rene Preval, who passed away recently, was the former President of which country? 8. What is the India’s GDP forecast for FY 17, as per Global rating agency Fitch? 9. Which state government has recently gave official language status to endangered tribal language “Kurukh”? 10. The 2nd edition of joint military exercise “Al Nagah-II” has started between India and which country?